Simplicity 2766 is becoming a total addiction for me, such so, that I am on my 3rd tunic..... rescue meeeee...lol This time around I used a bold print, trying to add more color after Tunics 1 & 2. I am seeing Tunics everywhere, satin tunics, silk tunics, cotton tunics and just simply tunics. I noticed tunics last year, but didn't give them any serious consideration, but this year, I am so loving the look. The great thing that I've learned in my quest to diversify my wardrobe is that Tunics look great with capris, jeans, wide-legged pants, leggings, and if I want to be daring wearing it solo with fierce boots. Well with Spring here, I need to start pushing the boots to the back of the closet and pull out or better yet go shopping for the sandals.... Here are a few tunics that caught my eyes. I don't think you need rescuing! 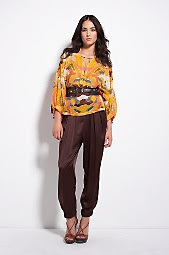 Tops and not your tunics adds diversity and are so easy to just put on and go. I've never been attracted to that pattern until I saw yours put together. Great job. I love the color! I agree with Faye " you don't need to be rescued". Gorgeous top! Love the bold print! I have this pattern & I haven't even used it. You have motivated me to try it. Your tunics look so good. I have some knit fabric calling out for this pattern. Lovely tunics! I am a bit the same - I have been ignoring the tunic trend as I worried they might cut me off and make me look short, but I tried one on in the shops the other day and I really liked it, so I will need to start making some too... maybe I will get hooked too! Thanks everyone. Well as of this comment I did another tunic and it was a bust. I LOVE IT! The fabric is gorgeous! Now I need to make one. Excellent work!! I can't wait to learn to sew. Keep them comming, this one looks FAB too!